1. 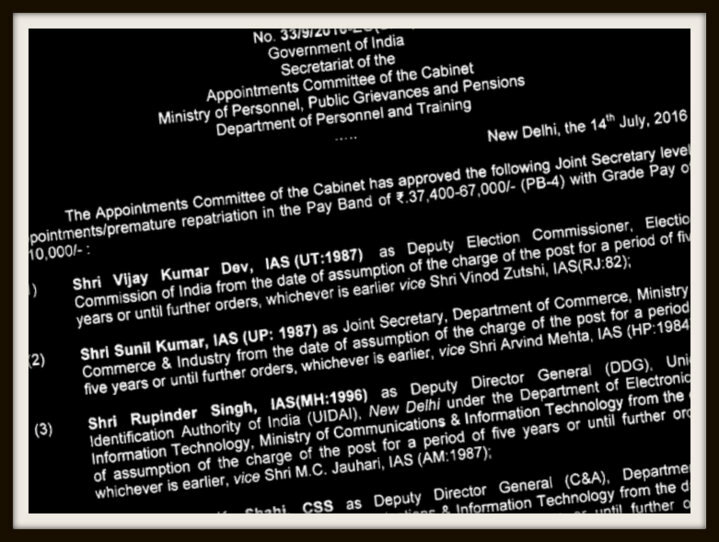 Vijay Kumar Dev, 1987 batch AGMUT cadre IAS, has been appointed as deputy election commissioner of India. 2. 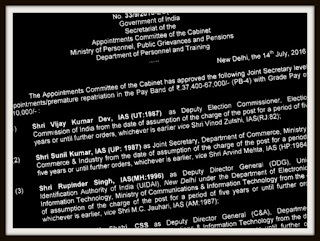 Sunil Kumar, 1987 batch UP cadre IAS, has been appointed as joint secretary in the department of commerce. 3. Rupinder Singh, 1996 batch Maharashtra cadre IAS, has been appointed as Deputy Director General, UIDAI, New Delhi. 4. CSS officer Sudhesh K Shahi has been appointed as Deputy Director General in the department of telecommunications. 5. Gyaneshwar Kumar Singh, 1992 batch IP and TA and FS officer, has been appointed as joint secretary in the ministry of corporate affairs. 6. K Moses Chalai, 1990 batch Manipur cadre IAS, has been appointed as joint secretary in the ministry of women and child development. 7. A Jayathilak, 1991 batch Kerala cadre IAS, has been appointed as chairman of Marine Products Export Development Authority (MPEDA). 8. Ms Vandana Kumar, 1992 batch IDAS officer, has been appointed as joint secretary in the department of industrial policy and promotion (DIPP). 9. Sanjay Kundu, 1989 batch Himachal Pradesh cadre IPS officer, has been appointed as joint secretary in the ministry of water resources, river development and Ganga rejuvenation. 10. Pranav Khullar, 1993 batch IP and TA and FS officer, has been appointed as joint secretary in the department of culture. 11. CSS officer VK Gauba has been appointed as joint secretary in the department of health research under the ministry of health and family welfare. 12. CSS officer Shyam Kapoor has been appointed as CMD of National Schedule Caste Finance and Development Corporation till his retirement on August 31, 2019. 13. CSS officer P Srivastava has been appointed as Member Secretary in National Commission for Protection of Child Rights. 14. Ms Neeraja Adidam, 1990 batch UP cadre Indian Forest Service officer, has been appointed as Managing Director in National Food Security Mission. 15. CSS officer RK Gupta has been appointed as joint secretary in the ministry of labour and employment. 16. 1995 batch Bihar cadre IAS B Rajender, currently joint secretary in water resources ministry, has been laterally shifted as joint secretary in the department of agriculture. 17. Ms Vandana Sharma, CSS officer, has been appointed as secretary in the Petroleum and Natural Gas Petroleum Board. 18. 1993 batch IDAS officer Ajay Ramesh Sule has been appointed as joint secretary in the ministry of home affairs (MHA). 19. 1991 batch Karnataka cadre IAS Ms Vidyavathi V, now joint secretary in DoPT, has been shifted to cabinet secretariat as a joint secretary. 20. G Dev Tripathi, 1998 batch Assam cadre IAS, presently PS to minister of drinking water department, has been appointed as joint secretary in DoPT. 21. 1991 batch Assam cadre IAS Vijayendra has been appointed as joint secretary in the department of defence production. 22. 1995 batch Himachal Pradesh cadre IAS Bharat H Khera, now joint secretary in the department of defence production, has been shifted to the department of defence as joint secretary. 23. CSS officer Subbarayan has been appointed as joint secretary in the department of defence. 24. 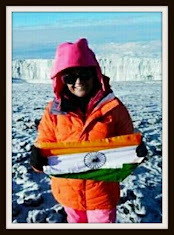 Jan-e-Alam, 1991 batch Nagaland cadre IAS, currently joint secretary in the department of school education and literacy under the ministry of human resources development (HRD) has been shifted to the ministry of minority affairs as its joint secretary. 25. The post of Managing Director of National Minorities Development and Finance Corporation held by 1989 batch PT and TA and FS officer Md Shahbaz Ali, has been designated as its CMD. 26. 1987 batch MP cadre IAS Rajesh Kumar Chaturvedi has been appointed as chairman, Central Board of Secondary Education (CBSE). 27. 1985 batch IDAS officer Rajnish, now joint secretary in department of defence (finance), has been repatriated to his parent cadre. Only 27officers in this list. Where is one officer, is this a mistake?